olaf mooij is a netherlands-based artist that has made a for himself modifying automobiles into odd shapes like brains and exaggerated electronics like speaker systems. 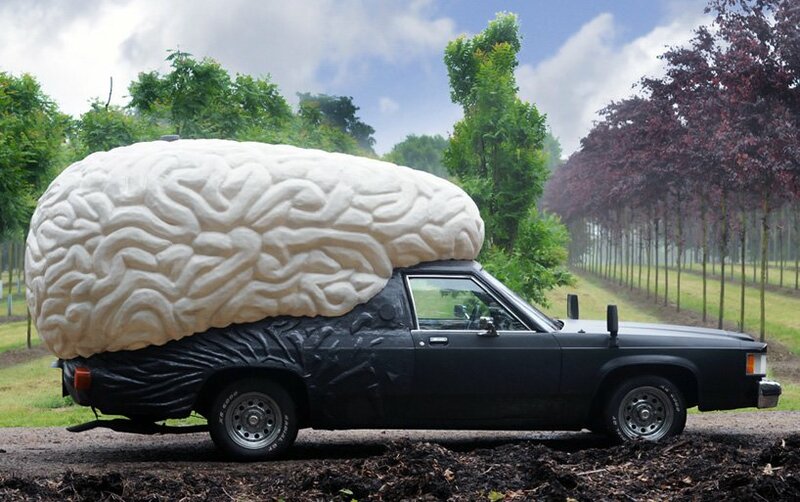 ‘braincar’ is a mobile sculpture created by rotterdam artist olaf mooij, featuring a large brain-like extrusion on the back of a modified used car. by day, the vehicle captures and stores images and video from its travels. by night, this footage is remixed, projected from within the brain sculpture and visible from the outside. mooij’s body of work involves the alteration of motor vehicles, in pieces that express the nearly psychological connection between drivers and their cars, or that convert vehicles into a kind of mobile sculpture architecture, as in ‘DJ mobile‘ or the sofa-like ‘chesterfield car’. with ‘braincar’, mooij questioned what it would be like if instead the car itself could experience with a kind of consciousness its own passage through spacetime. can you say “Ant Farm”? disappointing use of money time and energy. For what? Our world needs more art cars! More art cars! More art cars! This baby needs to go to Burning Man! a smart car i guess..
Olaf Mooij exhibits at [url=http://www.carartfestival.nl] Car Art festival [/url] in september. “my car” is probably (one of) the dumbest area of a man’s brain.